Blackhammer Cairn is one of the series of burial cairns excavated by Walter Grant in the 1930s that led to Rousay gaining the title of the Egypt of the north. It is found on a glacial terrace just above the line of the road that encircles the island, well signposted and within easy reach of it. Blackhammer Cairn was excavated in 1936. It is a well preserved stalled cairn originally dating back to around 3500BC. The remains of one individual were found in the most westerly chamber, and those of another in the entrance passage, which originally led off the side of the chamber. You approach the cairn today from the north west, and can immediately appreciate the wonderful view our distant ancestors wanted to provide for their rather less distant ancestors. 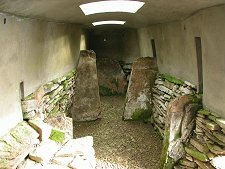 After excavation the cairn was capped by a concrete roof covered in grass, complete with translucent blocks to allow light into the interior. This replaced what would originally have been a corbelled stone roof which had been badly damaged over the intervening centuries. 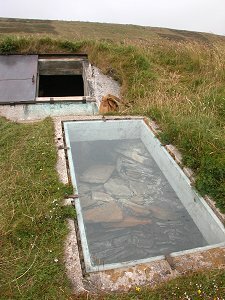 The modern entrance is via a sliding hatch and down a short ladder through the roof near the south east end of the cairn. Your first impression is how high the modern concrete cap is, with vertical sides meeting and covered by a curved roof. This detracts a little from the contents, which comprise seven compartments. 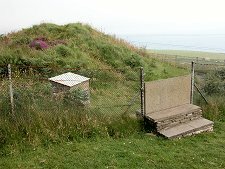 A transparent panel below the modern entrance gives a glimpse of the outer wall of the cairn. This is quite remarkable. 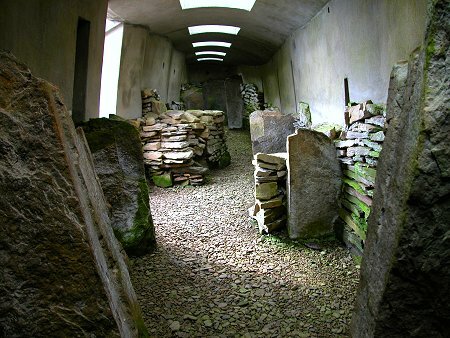 Although of dry stone construction, the stones have been laid to give the impression of triangular areas across which the grain of the laid stone flowed in different directions. Grid Ref: HY 414 276.